At: Amazon.com, Barnes & Noble.com or your local independent bookstores throughout the country. I began this project after my youngest child graduated from college and left me an empty nester. I had no one to cook for, no one to share meals with. I felt the quiet most often in the kitchen. In the spring of 2007, I began traveling back and forth across the nation interviewing what I now know is a new breed of young people who, like many in the 60s and 70s, find passion in good food. Their sustainable lifestyles revolve around food that has been grown locally, without pesticides, herbicides, hormones, or chemical fertilizers. They understand that the privilege of healthy eating does not come easily. It comes from hard work on the land, in the schoolroom and by using the political process. Healthy food is a right for everyone. The young people profiled in a very abbreviated fashion here, are examples of young people living and working across this wide nation of ours, who are exploring means of democratizing our food system to produce healthy, nutritious food for all. Sitting at their tables, I became reinvigorated, enthusiastic again about my food choices. My book is a collection of their stories and their recipes illustrated with photographs. As Michael Pollan says about the book: "Growing Roots introduces us to a few dozen young food pioneers through their words, photos and, even more usefully, through their recipes. Think of it as a community cookbook for the food movement." Alice Waters says: "Seeing the publication of 'Growing Roots: The Next Generation of Sustainable Farmers, Cooks and Food Activists' fills me with hope. It was not so long ago we feared there wouldn’t be enough individuals to fill a book like this, let alone the incredible movement of young sustainable farmers, cooks and activists who are spreading exponentially across the nation. 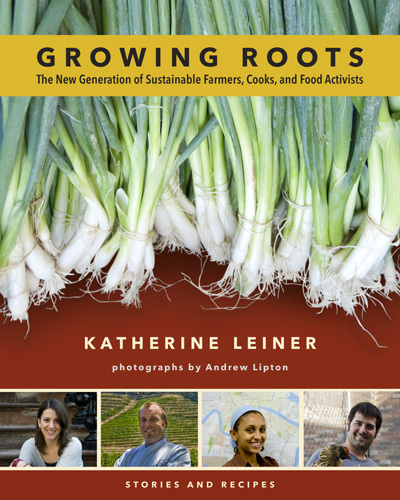 Katherine Leiner has compiled a wonderful anthology of revolutionary, individuals who continue to push for the holistic change we need to see in the food system." I hope you find their stories as enlightening and inspirational as I do, and their food as simple and delicious. "Growing Roots: The New Generation of Sustainable Farmers, Cooks and Activists" focuses on who's growing our food these days. With consumers turning their attentions from the manufactured to the local and organic, Katherine Leiner goes in search of how growing food in America is changing. What she finds is surprising: a highly educated generation—many of whom were not born into that life—are redefining agriculture.